For the finale of Gogo Graham's fall 2019 show, performance artist Leah James walked down the runway in a sunny, airy room on a high floor at the New Museum. James wore a voluminous pink organza wedding dress, a veil streaming down her back. She walked slowly, gasping, clutching at her heart. Blood trickled from her forehead. On the soundtrack, you could hear Graham's voice choking out the words "I love you, I love you, I love you." It was spectacular. Graham has been working somewhere between the art and fashion spaces for several seasons now, but this presentation felt like something of a breakthrough. 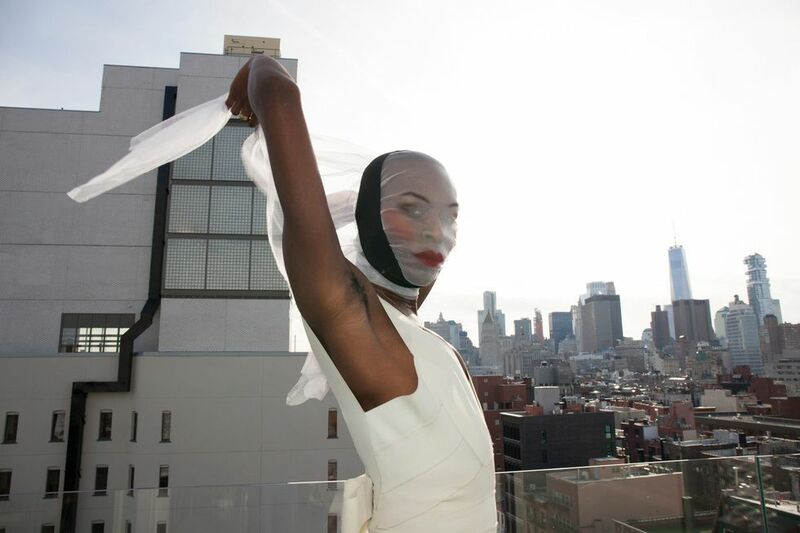 This season, the designer, who makes work which specifically celebrates the trans female body, showed dramatic, sirenic gowns with matching head coverings. I thought they were wedding dresses, but that wasn't quite it. "I was thinking a lot about garments someone could wear to be married in or be buried in," Graham said after the show. "It's ceremonial." The whole show had a sacred air to it. Graham let her models, clad in rippling, divinely feminine dresses, take their time walking down the runway, the opposite of the Midland Agency-style stomp that's become a New York Fashion Week signature. They glided across the room, twirled in front of the camera, clasped their hands in prayer. I think Naomi Campbell would approve. "When I go to shows, I always feel like everything goes by so quickly," said Graham. "Like you can't even see the clothes. So I wanted people to be able to take in the looks." And James' bloodletting performance, part of her general artistic practice, was an essential highlight. "When I saw her do it, I knew I wanted her to do it in the show," said Graham. "She's just incredible, and I think she really knew how to feel the emotion of the atmosphere. We worked together to make sure the effect was as strong as possible." James used hypodermic needles to pin her wedding veil to her forehead, puncturing the skin. She pulls them out during the performance, causing a steady drip of blood. When we spoke, she still had one stuck in her face. It's quite the admirable commitment. "I've been sisters with Gogo for a really long time, and we've always loved each other's work," said James. "This came together organically. She asked if I wanted to be in the show, and I was like yes, absolutely, and I was so happy to be able to bring a little of what I do into it."